A good starting point for any plant is to remove dead, diseased, or damaged stems as soon as you see them. Dead stems attract insects and invite diseases to develop. Also remove crossing branches, water sprouts (vigorous upright growing shoots that form on trunks or side branches), and suckers (vigorous shoots that develop near or from below ground). It is essential to a plant’s health, beauty, and safety. Keep all of these priorities and a few others in mind when you prune. Often and corrective pruning keeps trees, shrubs, and vines healthy by eliminating some problems and preventing others. Generally, pruning encourages new growth and vigor. Removing select branches lets light and air reach more parts of the plant. The ongoing priorities of pruning are the same for any plant. Remove damaged, diseased, or dead parts. When left on the plant, these parts become a harbor for pests and disease. Other goals with pruning are for example improving the plant one way or another. Pruning is necessary when branches create a safety issue, such as leaning precariously over a house or reaching overhead electric wires. These situations should be handled by a professional if possible. When you wish to see more flowers on roses or fruit on your trees pruning is needed. Pruning also helps reveal the colorful bark for cosmetics. And pruning prompts new colorful stems on shrubs. Pruning can control a plant’s size, whether you have a shrub planted too close to the house, an overly assertive vine, or a shapely bougainvillea. Pruning helps maintain a plants natural form or creates a formal shape. It depends on the plant and your goal, whether you have a casual hedge of lilacs or a tidy border of boxwoods. In the long run, pruning helps preserve plants integrity and your investment in it. Remember trees, shrubs, and vines vary in their growth habits and needs for pruning. Pruning helps you get to know your plants better and prompt them to become their best. Removing all dead wood minimizes entry points for pests and diseases. Eliminate diseased parts, cutting back to a healthy branch or bud. Remove broken or injured branches as close to the parent limb as possible. Pruning can be dangerous. Common sense and the proper use of the right equipment will help keep you safe while pruning. Dress appropriately for pruning, wearing long pants, long sleeved shirt, gloves, safety glasses, and nonslip shoes. A brimmed hat keeps the sun from obscuring your vision. Keep tools sharp and clean. Store a sharp tool in a protective sheath, if possible. Carry pruning tools with the points facing down. Choose a clear, still, dry day for pruning. If you must prune from a stepladder, tie it securely to the tree. Keep one hand on the ladder and one hand on your pruning saw. Have someone on the ground to help secure the ladder. You will avoid common mistakes when you follow these simple guidelines. It is not complicated once you understand a few basic principles that will help ensure your success. These guidelines hold true whether you are pruning trees or shrubs. Always use clean, sharp tools. 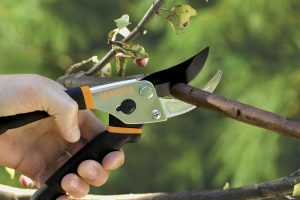 Select the right-size tool for the branch you will prune to avoid damage to the plant and the tool. Use a pruning saw on branches larger than 3 to 5 cm in diameter. Pruners work best on the smallest branches. Use loppers on branches and 3 cm or so in diameter. Summer is the best time to remove dead branches when they stand out. Prune spring-flowering trees and shrubs right after they finish flowering in spring. Trees and shrubs that bloom during summer and into autumn are best pruned in later winter or early spring as soon as their annual growth begins. Refrain from autumn pruning because it stimulates new growth that could be killed by winter cold. Prune anytime: suckers; water sprouts; branches that are dead, diseased, or damaged. Holding the thinner, upper cutting blade nearer to the trunk or main stem, make a clean cut without tearing the bark. Avoid leaving a stub, which is unsightly and provides an entry point for pests and diseases. Cut just outside the branch collar, the swelling where the branch begins. RIGHT TOOL Use short- or long-handled shears to cut small branches. Switch to a pruning saw for larger branches. RIGHT TIME Late winter allows you to see the shape of a dormant (not growing) plant. RIGHT CUT Prune with the blade held next to the branch collar (the swelling where branch meets trunk). DISINFECT SHEARS Clean shears between pruning jobs. Rub the blades with a disinfectant to prevent the spread of disease. If you prune young trees it encourages strong natural forms and leads to less work for you later in their lives. There’s no need to prune a newly planted tree unless it has damaged or dead branches. Give it a year to establish itself before pruning. Over the next few years, prune annually to remove poorly positioned branches (crossing or competing) and help the tree develop its ideal form. Established trees need occasional pruning to remove dead branches. If the tree has been neglected, it may be necessary to control its size, reduce excess shade, or prevent branches from rubbing against each other, wires, buildings, or vehicles. As a rule, cut no more than one-fourth of the tree’s branches in one year. If a tree needs extensive renovation, spread the task out over two or more years. Cutting more than 25 percent of any tree’s branches can compromise its viability. RUNED YOUNG TREE it’s easier to prune a tree when it is young. Removing a low branch allows freer movement such as mowing beneath it. COMPETITIVE BRANCHES sometimes parallel or sharply angled to a main branch, competing branches weaken a maturing tree. CROSSING BRANCHES Limbs that cross or rub may lead to decay or death. Leave the branch that best fits the overall structure. Or large limbs, taxing the trees strength. SUCKERS Shoots from the trunk base or roots compromise the trees natural shape and drain its energy. Big branches are best removed in steps to avoid damage to the tree or to you. Remove a branch too large to hold in one hand with three separate cuts, using a bow saw. Make the correct cuts using a three-step process instead of trying to do it in one cut, which can rip the bark from the tree. Also avoid leaving a stub, which will decay eventually and may become a harbor for pests. 50 m from the initial cut. Make the third cut just outside the branch collar to remove the stub. Leave the branch collar; it contains chemicals that speed the formation of callous, healing the wound. Let wounds heal on their own. Applying tar like wound dressings is no longer recommended. The treatment does not benefit the tree or speed healing in most cases. Although it may a take a number of years, some trees that have been pruned incorrectly can be improved. When you start to correct a poorly pruned tree, begin by looking for hidden decay in branch stubs. Prune stubs back to healthy wood.